This entry was posted in Uncategorized on October 31, 2006 by ASimPerson. No post for now, except that more than 1 Sun Belt team will get a bowl bid this year. You can access them via the link on your right. I may edit this if I have some sort of free time later this week (hah!). This entry was posted in Uncategorized on October 30, 2006 by ASimPerson. Michigan State University – Well, you’ve now gone from being the worst finishing team in land to the worst starting team in the land. You were down 46-7 before 2 meaningless TDs in the 4th to make it kind of respectable. University of Nebraska – After looking respectable against Texas, you fell to Oklahoma State this week, making the Big 12 North race a lot more interesting. University of Miami – Two in a row! GT now has the easy road to the ACC Championship Game. 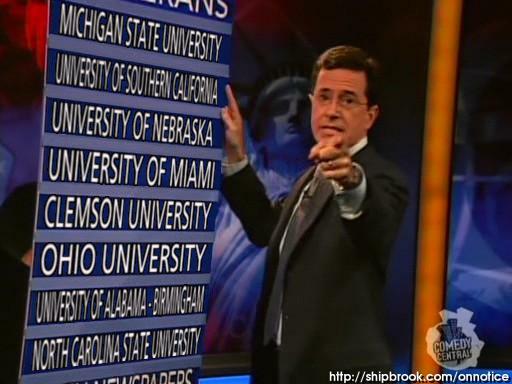 Clemson University – After reaming GT, you go and lose to VT, making the ACC Atlantic race wide open. On the other hand, I’m glad you lost, because I didn’t want GT to play you again for the Championship. 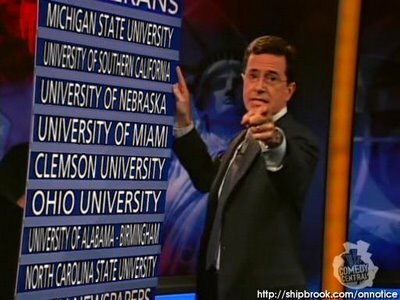 Ohio University – Despite sucking, you’re now bowl eligible. Wooo. University of Alabama-Birmingham – (Honorable mention to UConn, Rutgers, Idaho, and Hawaii) – The upcoming UAB-SMU game (and the Idaho-Hawaii game) is being played this Tuesday night, which makes absolutely no sense. Rutgers and UConn play on Sunday night, which is odd since neither of these teams are in the NFL. Stick to Thursday and Saturday during the regular season, ok? North Carolina State University – Chuck Amato has apparently decided that he is not, in fact, the man. You’re next. This entry was posted in Uncategorized on October 28, 2006 by a5. Before I begin, I think yesterday’s whipping of Clemson by Virginia Tech officially ends any validity of the Transitive Property in application to college football. If you forgot, recall that: 1) GT whipped VT a few weeks ago in Blacksburg, 2) Clemson whipped GT last weekend in Clemson. So, yeah. Anyway, let’s do this. As always, this reflects my being here in Atlanta, which means these are the games I get on the Georgia Tech Cable Network and that the times are Eastern. Oklahoma @ Missouri, ABC: A close game, I think, and a win established Mizzou as the class of the Big 12 North, and perhaps a re-emergence of some evenness in terms of the competitiveness of the Big 12’s divisions. Notre Dame @ Navy, CBS: ND rolls. NC State @ Virginia, local ACC affiliate: Well, NCSU came back and beat BC and FSU and seems to have a quarterback again. I have to like them here, even at UVA. Also, Virginia still doesn’t really have an offense. Northern Illinois @ Iowa, ESPNU: Well, Ehren, Iowa may be overrated, but you have to like them here. Northwestern @ Michigan, ESPN: Well, let’s see, Michigan is good this year, and not only did NU’s coach die in the offseason, they just allowed the biggest comeback in DI-A history. UMich rolls. UIUC @ Wisconsin, ESPN2: The Fightin’ Ron Zooks head up to Madison, WI. Did you know that Wisconsin’s campus has 6 pubs on it, and unlike GT’s so-called “pub”, they actually serve, you know, alcohol. Wisconsin also plays the Budweiser, but they say “When you say Wisconsin, you’ve said it all!” instead of the proper way (like we do). At any rate, they win. Miami (FL) @ Georgia Tech, ABC: I have no idea what to make of this game. It’s homecoming for us, and Miami returned a lot of their tickets, so this may be the largest Tech crowd ever. Miami may have an “us against the world” mentality due to their recent “adversity”. We got blown out at Clemson last week, but a GT win here pretty much seals the division for us. There’s a lot riding on this, and in several ways, is probably our most important game of the season. Florida vs. Georgia, CBS: I’ll still call it “The World’s Largest Outdoor Cocktail Party”, but honestly, since when do rednecks drink cocktails? Also, UF rolls. Wake Forest @ UNC, ESPNU: Ironically, UNC’s players may now play better since it’s confirmed that their coach is gone after the season. Nonetheless, Wake is a solid team and avoid the loss. USC @ Oregon State, FSN: Who will knock off USC? Probably not the beavers. Texas @ Texas Tech, TBS: Texas Tech doesn’t really seem to have the “magic” this year, and so Texas will probably be the ones scoring 60 points here if anyone does. Arkansas vs. UL-Monroe, ESPNU: I can’t tell if this is being played at a neutral site or counts as a “home” game for UL-Monroe, but honestly, I don’t care. FSU @ Maryland, ESPN2: Remember when these teams were good at that offense thing? Yeah. FSU should win. 7:45: Tennessee @ South Carolina, ESPN: Fulmer! Spurrier! The UT of the South seems to be good this year, and despite Spurrier blowing out Vandy last week, UT should roll. That’s all I got kids. Feel free to dispute below. This entry was posted in Uncategorized on October 26, 2006 by ASimPerson. Well, last week was pretty awesome for the Tito College Football Predictor. The CFP went 44 and 11, an 80% success rate in its first week of the 2006 season. The system even correctly picked the Washington State upset over Oregon. The largest margin of a missed pick was 5.0 (Oklahoma State over Texas A&M), so the higher margin ranges looked really good last weekend. This weekend, the CFP went out on a limb and made five questionable upset picks. Oklahoma State is up 10 points on Nebraska, who looked pretty good against powerhouse Texas last week. Missouri is actually 4.9 points up on Oklahoma, but that’s with the 5-point home field advantage. Navy is picked to beat Notre Dame (also with the home field advantage) by a ratings margin of 3.2. (This is the one I doubt the most. The last time Navy beat Notre Dame was in 1963. That’s 42 straight losses to the Fighting Irish.) Purdue was picked over Penn State by 2.4 points. Lastly, Oregon State was picked by 0.2 over USC. (You know which one I want to happen most.) What’s the likelihood that all five of these will happen? Almost zero. Still, I’ll be surprised if none of them do. Michigan, Boston College, Ohio State, and Arkansas all get gimmees this week. They are all favored by 16 points or more over their opponents (Northwestern, Buffalo, Minnesota, and Louisiana-Monroe). We’ll see how my year-to-date record is holding up at the end of Saturday. You can find the rest of this week’s picks at http://tito.asimweb.org/cfp/week9.html. This entry was posted in Uncategorized on October 25, 2006 by Kenneth.